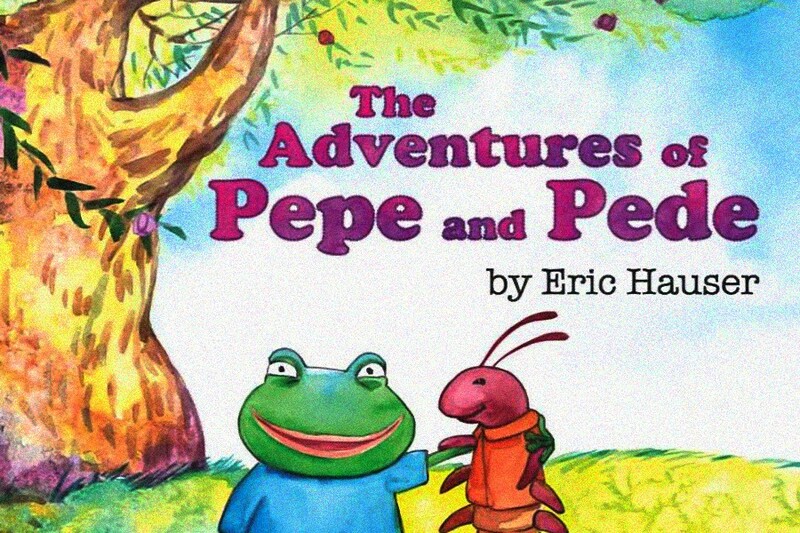 But the limits of Pepe as a propaganda tool are made even clearer by the story of Eric Hauser, the assistant principal of a Texas middle school who wrote a children’s book about the notorious amphibian. Published by a press that focuses in part on Christian and conservative political fare, The Adventures of Pepe and Pede is an attempt to translate xenophobic 4chan jargon into a kid-friendly narrative. It also prompted petitions demanding Hauser’s ouster, and it did eventually get him canned. Besides Pepe, there are allusions to places like “Kek Cliff” and “Patriots Plateau.” The evil farmer is said to have previously oppressed our heroes and all of “Wishington” for eight long years. And the inclusion of the centipede character is a shout-out to the redditors of r/The_Donald, who frequently call themselves “pedes.” The book even opens with a recognizably Trump Train dedication “to my fellow centipedes.” (“May we never tire of winning,” Hauser adds.) While only those steeped in this asinine language will recognize every reference, you don’t need a Ph.D. in digital subcultures to be alienated by it. But again, the Pepe brigade is too obsessed with their in-jokes to effectively indoctrinate anyone. After all, these concepts were designed to keep outsiders at arm’s length. For all the hand-wringing over what Pepe now represents, there’s a chasm opening between the image of the lonely, purposeless young men who cherish him and the strength that serious white nationalists want to project. To put a fine point on it: No militia does itself any favors by adopting a cartoon frog mascot. And while edgy or transgressive 4chan memes may draw the disaffected youth into online hubs of hate, a physical war over fascism could drive many away. As Angela Nagle asks in The Baffler this week, “How many of these racist trolls are committed to the real-life violence and potential state repression that the movement’s goals will now summon forth?” After all, a lot of them got involved for the lulz (or keks), not to become jackboots on the ground. True to form, only #MAGA dead-enders already obsessed with this branch of alt-right rhetoric are praising The Adventures of Pepe and Pede on Amazon and Twitter. Their aim is to make it into a bestseller, thereby owning the “libs” who condemn it. That’s not how propaganda works! You don’t win a culture clash by reinforcing a set of cryptic signifiers among the people on your side — you seduce the middle with easy answers to whatever irrational fears you’ve stoked. Dog-whistles mean nothing to children who don’t know what they’re listening for, and Pepe the Frog is far less innately appealing to potential white supremacist drones than putting on riot gear and grabbing a tiki torch. And in the end, the result is the same: You’re discovered, shamed, disowned, and fired. But by all means, let them keep trying with memes, because it continues to expose the weakness of their factional coalition. Forged online, the alliance between militant neo-Confederates and anti-PC trolls cannot seem to survive daylight. They agree to dehumanize everyone else but lack consensus on how to see themselves. With a little luck, Pepe will soon devolve from a badge of unity to the face of this great schism.